Home Page / Lean Thinking / What is Lean? understanding what’s really going on at the place where value is created – commonly known as the gemba. improving the processes by which products and services are created and delivered. developing and empowering people through problem solving and coaching. developing leaders and an effective management system. 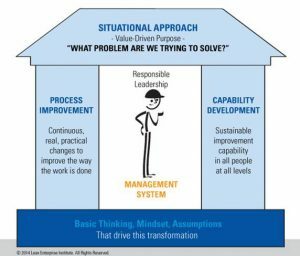 Lean thinking and practice help organizations become both innovative and competitive, which in turn allows them to become sustainable.